This popped up on the Big Horse FB page. Has had some interesting modifications. Nice looking car. 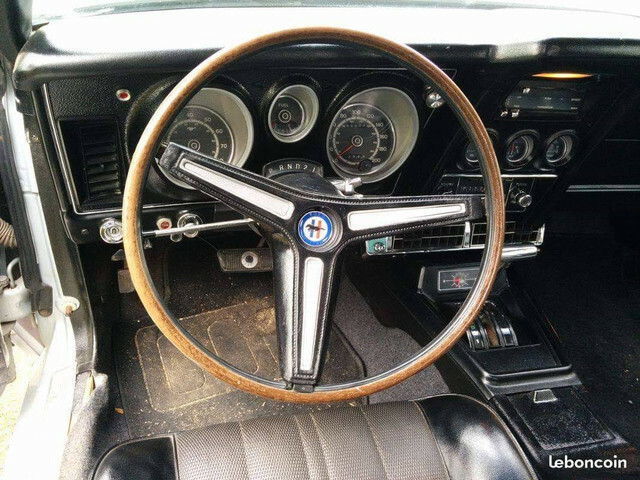 It always amazes me how many people polish up the outside of the car and the dash for the photos, but just can't take a vacuum cleaner to the carpet. (03-28-2019, 11:35 AM)Don C Wrote: Nice looking car. It always amazes me how many people polish up the outside of the car and the dash for the photos, but just can't take a vacuum cleaner to the carpet. I'd say, he's not good at polishing the outside either. Would you clean/polish, then drive on a muddy road and then take the picts? The text says the bumper just needs be rechromed, but the bumper being quite high in center and a damaged front valance tells me this baby got a big kiss on the nose and you will need more than a rechrome to fix that. The lack of engine picts works as a red flag on me. He claims it runs like a clock. I guess it's ok then. It's surely not an old v8 with new shiny valvecovers/airfilter in a rusty compartment. In another register, I notice there is gear/trans indicator on top of the column. Was this an option or was it a Mexican only thingy? I noticed the column indicator as well. Originally I thought maybe it had something to do with French motor vehicle regulations, but the guy who posted the pics said it was done by the owner. How he knows that, I did not verify. It was also interesting the the A/C installer decided to put the unit in the center of the dash and move the original heater controls to the storage pocket. 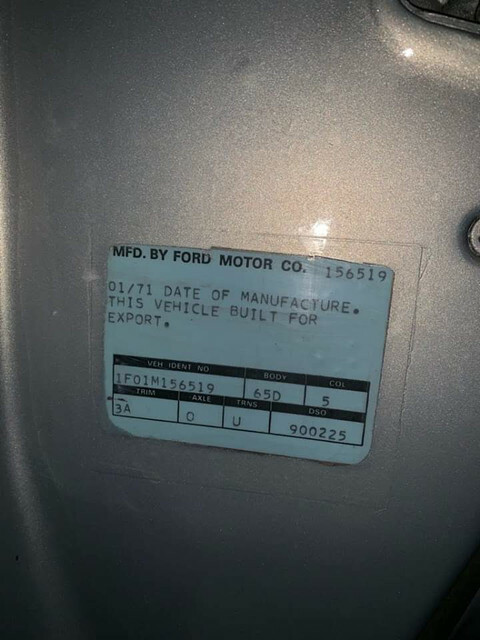 The car isn't a Mexican Mustang, data plate shows it was a Dearborn built car with an Export DSO code. It does have a supplemental data plate, which I assume is French. boy,you guys dont miss a thing!! I'm trying to figure out how you guys picked up on all of those things (except the dirty carpet) from 3 pictures! (03-29-2019, 07:35 AM)Hemikiller Wrote: I noticed the column indicator as well. Originally I thought maybe it had something to do with French motor vehicle regulations, but the guy who posted the pics said it was done by the owner. How he knows that, I did not verify. It was also interesting the the A/C installer decided to put the unit in the center of the dash and move the original heater controls to the storage pocket. I don't see any data plate on these 3 picts (was it posted on FB?). 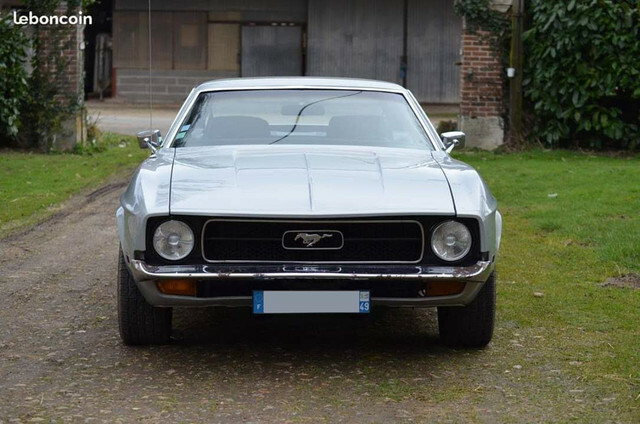 But both my 71 & 73 are imports, also originally put for first on the road with french plates. The extra plate, I had is some stamped thingy that needed be bolted in engine compartment. Later on, for private imports you would get some rivetted version of that plate. Both my car do not have this indicator, and never seen one either, at least when I was still living in France. Made in the USA for the rich mexicans. Interesting indeed. On both my cars, it's no storage there tho, its some rotating cylinders to direct the blown air. And seen some Grandé's have a script there. Here are the pics from the FB post. Standard heater cars had a storage pocket, which is replaced by a set of vents if you ordered A/C from the factory. 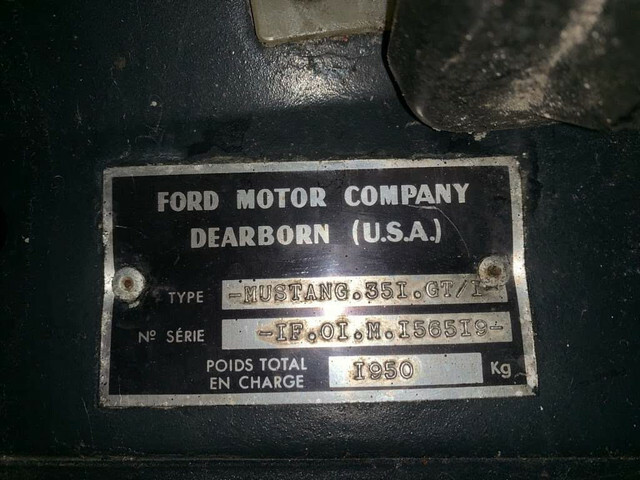 All non-gage pack cars would have a script in the center, either "Mustang" or "Grandé'" etc.